AFC Bournemouth round off their pre-season training camp with an entertaining win over Levante. 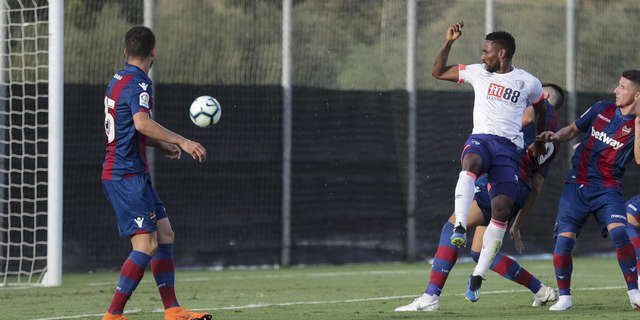 Lewis Cook’s late winner secured a 4-3 victory for the Cherries at the La Manga Club Football Centre, adding to first half efforts from Emerson Hyndman, Jermain Defoe and Connor Mahoney. It brought a successful end to the club’s Spanish training camp, following 11 days of hard work and two matches in which they came out unbeaten. An enthralling first half saw AFC Bournemouth break the deadlock on nine minutes with a fantastic team goal. A swift, flowing move saw the ball worked out to Simon Francis wide on the right, and the captain cut the ball back towards the edge of the area, where Hyndman was approaching. The young American international still had plenty to do but made it look simple, placing a side-footed strike low into the bottom corner. And less than four minutes later they had doubled their advantage with an effort every bit as good as their first. This time it stemmed down the left flank, and when Ryan Fraser delivered a ball into the heart of the penalty area, Defoe nipped in front of his marker to impressively flick home past Oier Olazabal. Levante responded immediately and halved the deficit through Roger Marti, who curled into the far corner after a loose ball had fallen kindly to him on the edge of the area. Immediately after, Artur Boruc had to be at his best to parry clear a long-range shot from Jason Remeseiro, which was heading in. But the veteran stopper could do nothing to prevent Levante’s equaliser on 23 minutes. When possession was lost in the middle of the park, a quick ball over the top released Emmanuel Boateng who, having beaten the offside trap, kept his composure to slot home. And on 35 minutes, the La Liga side turned the friendly on its head. Former Blackburn man Ruben Rochina threaded a pass in behind the Cherries’ defence and Marti sent an angled strike across Boruc and into the far corner. But rather than feel sorry for themselves, Jack Simpson got Bournemouth back on terms shortly before half-time, rising highest to meet Connor Mahoney’s deep corner and apply the necessary touch. Eddie Howe made 11 changes to his side for the second period and they almost made the perfect start to proceedings. 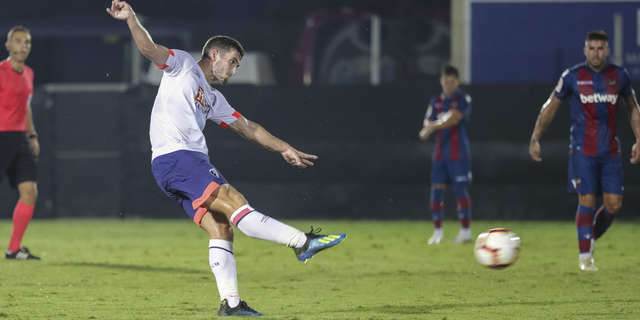 Marc Pugh exchanged passes with David Brooks and saw his cross deflected agonisingly across the goalline by a Levante defender but cleared away to safety. With ten minutes remaining, Pugh almost bagged a spectacular winner but saw his volley tipped over the bar by replacement keeper Koke Vegas. However, Cook fared better with time ticking away, receiving a wayward clearance and drilling a dipping strike past Vegas to secure the win. Cherries games are rarely dull and this proved no exception, with six goals in just 33 first-half minutes - and seven overall. While Eddie Howe will be delighted by his side’s attacking threat, particularly their opening two goals which were trademark flowing moves, he will have been equally concerned at the ease in which Levante pierced their rearguard on three occasions. However, a much more stubborn second half showing snuffed out their La Liga opponents and allowed them to secure a morale-boosting victory. Lewis Cook is yet to score for AFC Bournemouth in competitive action but proved he knows exactly where the back of the net is with his brilliant late winner. As Levante failed to properly clear their lines, the England international picked up the ball 25 yards out, steadied himself and pulled the trigger on a clinical strike that was in from the moment it left his boot. And with shooting like that, it surely won’t be long before the 21-year-old is celebrating a maiden Premier League goal.